Last night, London's tiny Electrowerkz club was rammed with people hoping to be converted to the cult of Chvrches... And they didn't leave disappointed. The trio hail from Glasgow, where they've played with a number of bands over the years - dabbling in emo and indie rock before settling on their current incarnation. 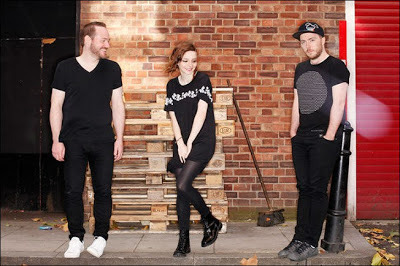 You can hear echoes of those earlier projects in the band's gothic brand of synthpop. Distorted riffs and an undercurrent of gloom underpin even their shiniest moments. Admirably, the band say they want to avoid the metronomic precision of modern pop. "We are trying to keep things rougher," keyboardist Martin Doherty told The Guardian. "Instead of quantising everything in a 'dance' way, we want to keep it rough, like demos." Imperfection gives the songs soul. But the dealbreaker is Lauren Mayberry's keening vocals. Simultaneously delicate and powerful, they come coated in a thick Glasgow brogue, which gives me flashbacks to Clare Grogan and her 80s band, Altered Images. Mayberry is immensely likeable, chattering away between songs, and warning fans she can see into the toilets from the stage. When the songs drift off into instrumental sections, she grabs a tambourine and windmills it around her in a way that suggests she'll grow into a superb frontwoman, given a little more time. The set falters slightly on a cover of Prince's I Would Die 4U - or, presumably, I Would Die 4V. Not that it's a terrible version, or even a bad song choice, just that the band never quite capture the juddering nihilism of the original (for more on the band's Prince obsession, read this interview). Things perk up after that, as Chvrches close the set with their two best songs - We Sink and The Mother We Share. After that, Lauren informs us she's off to book tickets for Bodyguard: The Musical, as the band are downing tools for the rest of the year. They should enjoy the break. 2013's going to be busy.